Dispelling the misconceptions #3 – Testing ISN’T running through a script to check against requirements! This is a big misconception that usually comes from other members of the project team not understanding what testers do. The fact is that some people don’t really know what testers do. And I believe a huge part of a tester’s job should be to be vocal about what they actually do. Running through a set of test cases with step by step instructions of how the software is intended to work, with columns for the expected results and a tick box to indicate “pass/fail” is not testing. I repeat – this is not testing. What I will say though is that I suggest that these scripts are the type of things that really ought to be automated. Automation should predominantly be the focus if you have a set of checks such as these, where you anticipate how the software should work and you have expectations that you can check against. You always need to weigh up the value of whether to actually automate these checks though. 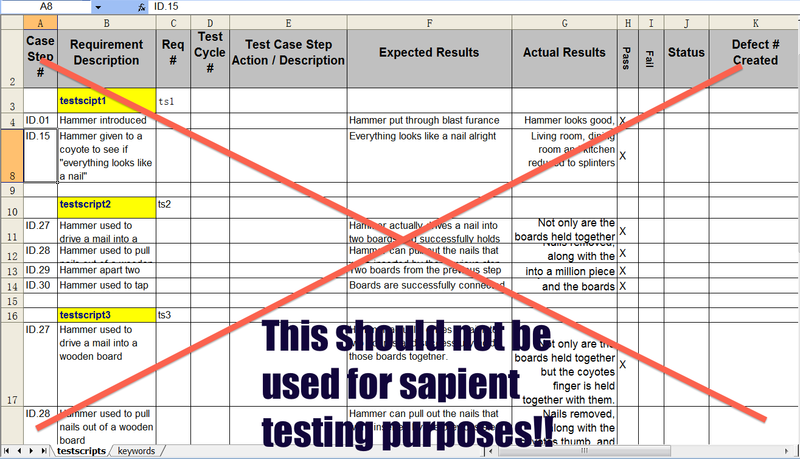 My advice: if you have a document in front of you that has columns for “Description“, “Steps“, “Expected Result” and “Pass/Fail?” and you plan to use this for your sapient testing – take out the 2 columns of “steps” and “expected results” from your document (put them aside to be automated), change the title of the “Pass/Fail” column to “Notes“, and open your creativity with some exploratory testing using your brain. And then talk about how you are actually testing to others so that they can learn that testing isn’t about following a script. Previous postNot bought your ATD2014 conference ticket yet? Want 15% off? Totally agree with what you say here.. Thanks for the comment Pabs! I think its important that people learn whats involved in testing and the skills that are required. I generally find that when I explain that exploratory testing as actually being structured with visibility through lightweight documentation (such as what you have with SBTM), compared to the lack of structure and lack of visibility that you get with ad hoc testing, they’re generally much more open to seeing it in action. David, I’m wondering why the comparison of testing vs checking. Aren’t they different tasks that share, somewhat, the same goal? Why is step by step worst or better than exp? Dan, you’re not by chance stating that checking has no value, even if done manually (I.e. not automated), are you? In my opinion you need both. This is not an either or situation. BTW, I do concur that testing and checking are two separate things. Hey Freddy! Thanks for the comment. Sorry for the delayed reply. Also, anything that is a check /can/ potentially be automated, although there won’t be any value in automating every check.